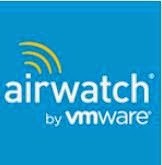 As you know, Airwatch is one of the leading Mobile Device Management (MDM) software and it’s acquired by VMware recently. VMware is actively working on integrating it with VMware Horizon Suite. Recently one of my customers asked me what are all platforms he can manage with Airwatch? I sent him list and thought of documenting the list here for community. Here is the list of platforms Airwatch supports as of AirWatch 7.3 Release. Could you write some posts about using Airwatch? My company is planning to acquire it and we'd like to have some unbiased opinion about it.